A flyleaf inscription attributes this Commentary to St. Dunstan, archbishop of Canterbury (d.988), probably because it is copied from a 10th-century exemplar which he annotated and corrected. 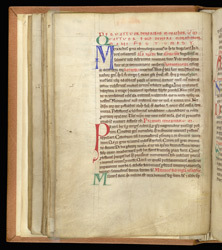 Dunstan is also depicted as the author in a full-page miniature, which has been extracted from the volume and is now kept separately. After the Commentary on the prologue is a list of chapters in the Rule, and then the Commentary on the Rule itself, starting on this page with a discussion of the different kinds on monk.